The modeling codes MAGFOX (Longhi, 1991), MAGPOX (Longhi, 1992), and FXMOTR (a modified version of FXMO and BATCH; Longhi, 2006) were developed in the early 1990s by experimental and lunar petrologist John Longhi to examine magma as it evolved via fractional or equilibrium crystallization. These were written using the FORTRAN programming language. The versions of MAGFOX, MAGPOX, and FXMOTR, have been translated into the MATLAB programming environment by Jesse Davenport (Centre de Recherches Petrographiques et Geochimiques), Clive Neal and Diogo Bolster (University of Notre Dame), Brad Jolliff (University of Washington St. Louis), and John Longhi (Lamont-Doherty Earth Observatory). The new suite of programs is being called Simulating Planetary Igneous Crystallization Environments or SPICEs and can be downloaded from here. 13 March 2019: Shannon Hall, New York Time – Sealed Cache of Moon Rocks to be Opened by NASA. 3 January 2019: Sarah Kaplan, Washington Post – China lands spacecraft on the far side of the Moon, a historic first. 30 April 2018: Rechelle Ann Fuertes, Edgy-Labs – NASA shocks scientists by cancelling the Resource Prospector. 28 April 2018: Sarah Kaplan, The Washington Post – Stunning scientists, NASA’s only Moon rover just got canceled. 27 April 2018: The Verge – NASA scraps a lunar surface mission – just as it’s supposed to focus on a Moon return. 27 April 2018: NASA Watch – Lunar community responds to Resource Prospector Cancellation. 27 April 2018: Alan Boyle, Geek Wire – NASA is reworking its Moon rover mission amid outcry from lunar advisory group. 27 April 2018: Eric Berger, Ars Technica – New NASA leader faces an early test on his commitment to Moon landings. 27 April 2018: Orlando Sentinel – NASA’s only Moon rover just got canceled. 27 April 2018: Alex Stuckey, Houston Chronicle – Scientists, engineers say lunar rover axed at NASA, ask Bridenstine to reinstate it. 2 April 2018: Should NASA Open (unopened) Samples from Apollo Missions? 29 March 2018 - ABC News, Washington DC area: "Notre Dame Professor Urges a Return to the Moon"
2017 NASA Transition Team White Paper - click here. The Lunar Exploration Analysis Group (LEAG). The full LEAG Lunar Exploration Roadmap can be found here. Lunar Science for Landed Missions Workshop, NASA Ames, 10 January 2018. Advancing Lunar and Solar System Science & Exploration through a Lunar Sample Return Campaign. Global Space Expoloration Conference (GLEX) 2012, Washington, DC - Keynote address: Exploring the Moon and Asteroids. SSERVI Exploration Science Forum 2015, Wargo Award Lecture. OPPORTUNITIES ARE AVAILABLE FOR GRADUATE STUDENTS! Contact me for details. 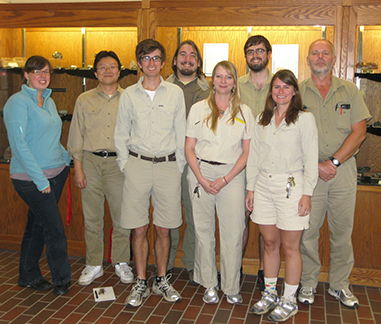 Dave Burney (PhD Candidate); Karl Cronberger (PhD Candidate); Mike Torcivia (PhD Candidate); Stu Webb (PhD Candidate); Hannah O'Brien (Undergraduate Reseacher); Donald Welsh (Undergraduate Researcher). Sarah Roberts (Masters, 2014) PhD Candidate, University of Tennessee, Knoxville. 1979-1982: University of Leicester, United Kingdom. B.Sc. (Hons) Geology - First Class. and Kimberlite-Type Intrusives from the Western Pacific. ENVG 20240/21240 - Igneous & Metamorphic Petrology. Devised and implemented the team-teach College Freshman course EG101 - "Mars: A 21st Century Frontier." Devised and implemented a "semester study abroad program" in Australia for our undergraduate programs during fall semester, junior year, at the University of Western Australia (Perth). ENVG 60380 - Environmental Isotope Chemistry. ENVG 60355 - High-Temperature Geochemistry. Origin, Evolution, and Environmental Impact of Oceanic Large Igneous Provinces (2015). Special Publication of the Geological Society of America. NEW VIEWS OF THE MOON (2006). Reviews in Mineralogy and Geochemistry, Volume 60. Bradley L. Jolliff, Mark A. Wieczorek, Charles K. Shearer, and Clive R. Neal, editors. Mineralogical Society of America. ISBN 1529-6466. Svensen H.H., Jerram D.A., Polozov A.G., Planke S., Neal C.R., Augland L.E., and Emeleus H.C. (2019) Thinking about LIPs: A brief history of ideas in Large Igneous Province research. Tectonophysics. Hui H., Hes K.-U., Zhang Y., Nichols A.R.L., Peslier A.H., Lange R.A., Dingwell D.B., and Neal C.R. (2018) Cooling rates of lunar orange glass beads. Earth Planet. Sci. Lett. 503, 88-94. Donohue P.H. and Neal C.R. (2018) Textural and mineral chemical evidence for the origin and evolution of olivine cumulate 71597. Amer. Mineral. 103, 284-297. Scientific Opportunities Enabled by Human Exploration Beyond Low-Earth Orbit: An ISECG Science White Paper (2018), 36 Pages. International Space Exploration Coordination Group. Hui H., Guan Y., Chen Y., Peslier A.H., Zhang Y., Liu Y., Flemming R.L., Rossman G.R., Eiler J.M., Neal C.R., Osinski G.R. (2017) A heterogeneous lunar interior for hydrogen isotopes as revealed by the lunar highlands samples Earth & Planetary Science Letters 473, 14-23. Scientific Opportunities Enabled by Human Exploration beyond Low Earth Orbit – The Summary (2016). International Space Exploration Coordination Group. Cronberger K. and Neal C.R. (2017) KREEP basalt petrogenesis: Insights from 15434,181. Meteorit. Planet. Sci.52, 827-841. Barnes J.J., Tartese R., Anand M., McCubbin F.M., Neal C.R., and Franchi I. (2016) Early degassing of lunar urKREEP by crust-breaching impacts. Earth Planet. Sci. Lett. 447, 84-94. Harper L.D., Neal C.R., Poynter J., Schalkwyk J.D., and Wingo D.R. (2016) Life support for a low-cost lunar settlement. No showstoppers. New Space 4, 40-49. Fagan A.L. and Neal C.R. (2016) A new lunar high-Ti basalt type defined from clasts in Apollo 16 breccia 60639. Geochimica et Cosmochimica Acta 173, 352-372. Hui H., Peslier A.H., Lee C-Y., Rudnick R., Chan Y., Simonetti A., Zhang Y., and Neal C.R. (2015) Interaction of a dry plume with cratonic lithosphere evidenced from water and trace element distributions in peridotites from Labait volcano, Tanzania. Geochemistry, Geophysics, Geosystems, 16, doi:10.1002/2015GC005779. Shearer C.K., Burger P.V., Bell A.S., Guan Y., and Neal C.R. (2015) Exploring the Moon’s surface for remnants of the lunar mantle 1. Dunite xenoliths in mare basalts. A crustal or mantle origin? Meteoritics and Planetary Science 50, 1449-1467. Donohue P.H. and Neal C.R. (2015) Quantitative textural analysis of ilmenite in Apollo 17 high-titanium mare basalts. Geochim. Cosmochim. Acta 149, 115-130. Neal C.R., Donohue P.H., Fagan A.L., O’Sullivan K.M., Oshrin J., and Hui H. (2015) Distinguishing between pristine mare basalts and lunar impact melts: A non-destructive method using quantitative petrography. Geochimica et Cosmochimica Acta 148, 62-80. Neal C.R., Schmidt G.K., Ehrenfreund P., and Carpenter J.D. (2014) Developing the Global Exploration Roadmap: An Example using the Humans to the Lunar Surface Theme. J. Space Policy 30, 156-162. Elardo S Shearer C.K., Fagan A.L., Borg L.E., Gaffney A.M., Burger P.V., Neal C.R., and McCubbin F.M. (2014) The origin of young mare basalts inferred from lunar meteorites NWA 4734, NWA 032, and LAP 02205. Meteoritics & Planet. Sci. 49, 261-291. Hui H., Neal C.R., Shih C-Y., and Nyquist L.E. (2013) Derivation of Apollo 14 high-Al basalts at discrete times: Rb-Sr isotopic constraints. Earth Planet. Sci. Lett. 373, 150-159. Fagan A.L., Neal C.R., Simonetti A., Donohue P.H., and O’Sullivan K.M. (2013) Distinguishing between Apollo 14 impact melt and pristine basalt samples by geochemical and textural analyses of olivine. Geochimica et Cosmochimica Acta 106, 429-445. Hui H., Peslier A.H., Zhang Y., and Neal C.R. (2013) Water in lunar anorthosites and evidence for a wet early Moon. Nature Geoscience 6, 177-180. Riches A.J.V., Day J.M.D., Walker R.J., Simonetti A., Liu Y., Neal C.R., and Taylor L.A. (2012) Rhenium-Osmium isotope and highly-siderophile-element abundance systematics of angrite meteorites. Earth Plant. Sci. Lett. 353-354, 208-218. Donohue P.H., Simonetti A., and Neal C.R. (2012) Chemical characterization of possible natural ilmenite material. Geostandards & Geoanalytical Research. 36, 61-73. Article first published online : 12 SEP 2011, DOI: 10.1111/j.1751-908X.2011.00124.x. Ehrenfreund P., McKay C., Rummel J.D., Foing B.H.,Neal C.R.,Masson-Zwaan T., Ansdell M., Peter N., Zarnecki J., Mackwell S., Antionetta Perino M., Billings L., Mankins J., and Race M. (2012) Toward a global space exploration program: A stepping stone approach. Advances in Space Research 49, 2-48. Schulte P., Alegret L., Arenillas I., Arz J.A., Barton P.J., Brown P.R., Bralower T.J., Christenson G.L., Claeys P., Cockell C.S., Collins G.S., Deutsch A., Goldin T.J., Goto K., Grajales-Nishimura J.M., Grieve R.A.F., Gulick S.P., Johnson K.R., Kiessling W., Koeberl C., Kring D.A., MacLeod K.G., Matsui T., Melosh J., Montanari A., Morgan J.V., Neal C.R., Nichols D.J., Norris R.D., Pierazzo E., Ravizza G., Robolledo-Vieyra M., Reimold W.U., Robin E., Salge T., Speijer R.P., Sweet A.R., Urrutia-Fucugauchi J., Vajda V., Whalen M.T., and Willumsen P.S. (2010) The Chicxulub asteroid impact and mass extinction at the Cretaceous-Paleogene boundary. Science 327, 1214-1218. Simonetti A. and Neal C.R. (2010) In-situ chemical, U–Pb dating, and Hf isotope investigation of megacrystic zircons, Malaita (Solomon Islands): Evidence for multi-stage alkaline magmatic activity beneath the Ontong Java Plateau. Earth Planet. Sci. Lett. 295, 251-261. Shearer C.K., Burger P.V., Neal C.R., Sharp Z., Spivak-Birndorf L., Borg L., Fernandes V.A., Papike J.J., Wadhwa M., Gaffney A., Shafer J., Geissman J., Atudorei N.-V., Herd C., Weiss B., King P.L., Crowther S.A., and Gilmour J.D. (2010) Non-basaltic asteroidal magmatism during the earliest stages of solar system evolution: A view from Antarctic achondrites Graves Nunatak 06128 and 06129. Geochim. Cosmochim. Acta 74, 1172-1199. Brandon A.D., Lapen T.J., Debaille V., Beard B.L., Rankenburg K., and Neal C.R. (2009) Re-evaluating 142Nd/144Nd in lunar mare basalts with implications for the early evolution and bulk Sm/Nd of the Moon. Geochim. Cosmochim. Acta 73, 6421-6445. Kinman W.S., Neal C.R., Davidson J.P., and Font L. (2009) The dynamics of Kerguelen Plateau magma evolution: New insights from major element, trace element, and Sr isotope microanalysis of plagioclase hosted in Elan Bank basalts. Chemical Geology 264, 247-265. Petterson M.G., Magu R., Mason A., Mahoa H., Tolia D., Neal C.R., and Mahoney J.J. (2009) A first geological map of Makira, Solomon Islands: Stratigraphy, structure and tectonic implications. In: Pacific Minerals in the New Millenium – The Jackson Lum Volume. SOPAC Tech. Bull. 11, 145-161. Neal C.R. (2009) The Moon 35 years after Apollo: What’s left to be done? Invited review in Chemie der Erde – Geochemistry, 69, 3-43 [doi:10.1016/j.chemer.2008.07.002]. Kramer G.Y., Jolliff B.L., and Neal C.R. (2008) Searching for high-alumina mare basalts using Clementine UVVIS and Lunar Prospector GRS data: Mare Fecunditatis and Mare Imbrium. Icarus 198, 7-18. Shearer C.K., Burger P.V., Neal C.R., Sharp Z., Borg L.E., Spivak-Birndorf L., Wadhwa M., Papike J.J., Karner J.M., Gaffney A.M., Shafer J., Weiss B.P., Geissman J., and Fernades V.A. (2008) A unique glimpse into asteroidal melting processes in the early solar system from the Graves Nunatak 06128/06129 achondrites. Amer. Mineral. 93, 1937-1940. Neal C.R., Coffin M.F., Arndt N.T., Ducan R.A., Eldholm O., Erba E., Farnetani C., Fitton J.G., Ingle S.P., Ohkouchi N., Rampino M.R., Reichow M.K., Self S., and Tatsumi Y. (2008) Investigating large igneous province formation and associated plaeoenvironmental events: A White Paper for scientific drilling. Scientific Drilling 6, 4-18. Liu G.J., Zhang X.R., Talley J.W., Neal C.R., and Wang H. (2008) Effect of NOM on arsenic adsorption by TiO2 in simulated As(III)-contaminated raw waters. Water Res. 42, 2309-2319. Liu G.J., Zhang X.R., McWilliams L., Talley J.W., and Neal C.R. (2008) Influence of Ionic Strength, Electrolyte Type, and NOM on As(V) Adsorption onto TiO2. J. Env. Sci. Health 43, 430-436. Kramer G.Y., Jolliff B.L., and Neal C.R. (2008) Distinguishing HA Mare Basalts Using Clementine UVVIS and Lunar Prospector GRS Data: Mare Moscoviense and Mare Nectrais. J. Geophys. Res. 113, E01002, doi:10.1029/2006/E002860. Silliman S.E., Boukari M., Crane P., Azonsi F., and Neal C.R. (2007) Observations on elemental concentrations of groundwater in Central Benin. J. Hydrology 335, 374-388. Révillon S., Teagle D.A.H., Boulvais P., Shafer J., and Neal C.R. (2007) Geochemical fluxes related to alteration of a subaerially-exposed seamount: Nintoku seamount, ODP Leg 197, Site 1205. Geochem., Geophys., Geosystems. 8, Q02014, doi:10.1029/2006GC001400. Dalheimer S., Neal C.R., and Fein J.B. (2007) Potential siderophore mobilization of platinum-group elements in surface environments. Env. Sci. Tech. 41, 870-875. Liu G.J., Zhang X.R., Jain J., Talley J.W., and Neal C.R. (2006) Stability of inorganic arsenic species in simulated raw waters with the presence of NOM. Water Sci. Technology: Water Supply6, 175-182. Neal C.R. and Kramer G.Y. (2006) The petrogenesis of Apollo 14 high-Al mare basalts. Amer. Mineral. 91, 1521-1535. Rankenburg K., Brandon A.D., and Neal C.R. (2006) Neodymium isotope evidence for a chondritic composition of the Moon. Science 312, 1369-1372. Kinman W. and Neal C.R. (2006) Magma evolution revealed by anorthite-rich plagioclase cumulate xenoliths from the Ontong Java Plateau: Insights into LIP magma dynamics and melt evolution. J. Volc. Geotherm. Res. 154, 131-157. Anand M., Taylor L.A., Floss C., Neal C.R., Terada K., and Tanikawa S. (2006) Petrology and Geochemistry of LAP 02 205: A New Unique Low-Ti Mare-Basalt Meteorite. Geochim. Cosmochim. Acta 70, 246-264. Chazey W.J. III and Neal C.R. (2005) The role of mineral-melt fractionation on the highly siderophile element abundances in Kerguelen Plateau basalts and a possible plume origin at the core-mantle boundary. Geochim. Cosmochim. Acta 69, 4685-4701. Shafer J., Neal C.R., Regelous M., and Gudding J. (2005) Geochemistry and petrogenesis of alkalic post-shield lavas from Nintoku Seamount, a 56 Ma Hawaiian volcano. Geochem., Geophys., Geosystems. Q05L09, doi: 10.1029/2004GC000875. Chazey W.J. III and Neal C.R. (2004) LIP magma petrogenesis from source to surface: Platinum-group element evidence from Ontong Java Plateau basalts recovered during ODP Leg 192. In Origin and Evolution of the Ontong Java Plateau (Fitton J.G., Mahoney J.J., Wallace P.J., and Saunders A.D., eds.). J. Geol. Soc. London Spec. Pub. 229, 219-238. Shafer, J., Neal C.R., and Castillo P. (2004) Compositional variability in lavas from the Ontong Java Plateau: Results from basalt clasts within the volcaniclastic sequence of Ocean Drilling Program Leg 192 Site 1184. In Origin and Evolution of the Ontong Java Plateau (Fitton J.G., Mahoney J.J., Wallace P.J., and Saunders A.D., eds.). J. Geol. Soc. London Spec. Pub. 229, 333-351. White R,. Godard M., Fitton G., Neal C.R., and Castillo P. (2004) Phreatomagmatic eruptions on the Ontong Java Plateau: Chemical and isotopic relationship to Ontong Java Plateau basalts. In Origin and Evolution of the Ontong Java Plateau (Fitton J.G., Mahoney J.J., Wallace P.J., and Saunders A.D., eds.). J. Geol. Soc. London Spec. Pub. 229, 307-323. Chazey W.J. III, Neal C.R., Jain J.C., and Kinman W.E. (2003) A reappraisal of geochemical reference material BHVO-1. Geostandards Newsletter 27, 181-192. Anand M., Taylor L.A., Neal C.R., Snyder G.A., Patchen A., Sano Y., and Terada K. (2003) Lunar meteorite EET 96008: Geochemistry and petrogenesis. Geochim. Cosmochim. Acta 67, 3499-3518. Tarduno J.A., Duncan R.A., Scholl D.W., Cottrell R.D., Steinberger B., Thordarson T., Kerr B.C., Neal C.R., Frey F.A., Torii M., Carvallo C., and Doubrovine P. (2003) The Emperor Seamounts: Southward motion of the Hawaiian hotspot plume in Earth’s mantle. Science 301, 1064-1069. Promprated P., Taylor L.A., and Neal C.R. (2003) Petrochemistry of mafic granulite xenoliths from Chantaburi-Trat basaltic field: Implications to the nature of the lower crust beneath Thailand. Internat. Geol. Rev. 45, 383-406. Ely J.C. and Neal C.R. (2003)Using platinum-group elements to investigate the origin of the Ontong Java Plateau, SW Pacific. Chem. Geol. 196, 235-257. Jones J.H., Neal C.R., and Ely J.C. (2003) Signatures of the highly siderophile elements on the SNC meteorites and Mars: A review and petrologic synthesis. Chem. Geol. 196, 21-41. Taylor L.A., Nazarov M.A., Shearer C.K., McSween H.Y., Jr., Cahill J., Neal C.R., Ivanova M.A., Barsukova L.D., Lentz R.C., Clayton R.N., and Mayeda T.K. (2002) Martian meteorite Dhofar 019: A new Shergottite. Meteor. Planet. Sci. 37, 1107-1128. Ely J.C. and Neal C.R. (2002) Method of data reduction and precision analysis for platinum-group element (PGE) data using inductively coupled plasma - mass spectrometry (ICP-MS). Geostandards Newsletter 26, 31-39. Neal C.R., Mahoney J.J., and Chazey W.J., IIII (2002) Mantle sources and the highly variable role of continental lithosphere in basalt petrogenesis of the Kerguelen Plateau and Broken Ridge LIP: Results from Ocean Drilling Program Leg 183. J. Petrology 43, 1177-1205. Tejada M.L.J., Mahoney J.J., Neal C.R., Duncan R.A., and Petterson M.G. (2002) Basement geochemistry and geochronology of central Malaita, Solomon Islands, with implications for the origin and evolution of the Ontong Java Plateau. J. Petrol. 43, 449-484. Neal C.R. (2001) The interior of the Moon: The presence of garnet in the primitive, deep lunar mantle. J. Geophys. Res. 106, 27,865-27,885. Jain J.C., Neal C.R., and Hanchar J.M. (2001) Identification and removal of fluoride interferences in determination of rare-earth elements in zircon by ICP-MS. Geostandards Newsletter 25, 229-237. Ely J.C., Neal C.R., Kulpa C.K., Schneegurt M.A., Seidler J.A., and Jain J.C. (2001) Impacts of platinum-group element accumulation in the USA from catalytic-converter attrition. Env. Sci. Tech. 35, 3816-3822. Neal C.R., Haggerty S.E., and Sauter V. (2001) "Majorite" and "Silicate Perovskite" mineral compositions in xenoliths from Malaita. Science 292, 1015-1018. Schneegurt M.A., Jain, J.C., Menicucci J.A., Brown S., Garofalo D.F., Quallick M.R., Neal C.R., and Kulpa C.F. Jr. (2000) Use of biomass by-products for the remediation of wastewaters contaminated with toxic metals. Env. Sci. Tech. 35, 3786-3791. Jolliff B.L., Gaddis L.R., Ryder G., Neal C.R., Shearer C.K., Elphic R.C., Johnson J.R., Keller L.P., Korotev R.L., Lawrence D.J., Lucey P.G., Papike J.J., Spudis P., Pieters C.M. and Taylor L.A. (2000) New views of the Moon: Improved Understanding Through Data Integration. EOS Trans. Am. Geophys. Union 81, 349, 354-355. Neal C.R. (2000) Issues involved in a Martian sample return: Integrity preservation and the Curation and Analysis Planning Team for Extraterrestrial Materials (CAPTEM) position. J. Geophys. Res. 105, 22,487-22,506. Frey F.A., Coffin M.F., Wallace P.J., Weis D., Zhao X., Wise S.E., Wähnert V., Teagle D.A.H., Saccocia P.J., Reusch D.N., Pringle M.S., Nicolaysen K.E., Neal C.R., Müller R.D., Moore C.L., Mahoney J.J., Keszthelyi L., Inokuchi H., Duncan R.A., Delius H., Damuth J.E., Damasceno D., Coxall H.K., Borre M.K., Boehm F., Barling J., Arndt N., and Antretter M. (2000) Origin and evolution of a submarine large igneous province: The Kerguelen Plateau and Broken Ridge, Southern Indian Ocean. Earth Planet. Sci. Lett. 176, 73-89. Jain J.C., Field M.P., Neal C.R., Ely J.C., and Sherrell R.M. (2000) New recommended values for the REE in geological reference materials DTS-1 (dunite) and PCC-1 (peridotite) using different ICP-MS analytical techniques. Geostandards Newsletter 24, 65-72. Petterson M.G., Babbs T.L., Neal C. R., Mahoney J.J., Saunders A.D., Duncan R.A., Tolia D., Magu R., Qopoto C., Mahoa H., and Natogga D. (1999) Geologic-tectonic framework of Solomon Islands, SW Pacific. Crustal Accretion and growth within an intra-oceanic setting. Tectonophysics 301, 35-60. Sobolev V.N., Taylor L.A., Snyder G.A., Jerde E.A., Neal C.R., and Sobolev N.V. (1999) Metasomatism of the mantle beneath Yakutia: A quantitative study of secondary chemistry and mineralogy in Udachnaya eclogites. Internat Geol. Rev. 41, 391-416. Ely J.C., Neal C.R., O’Neill J.A., and Jain J. C. (1999) Quantifying the Platinum Group Elements (PGEs) and Gold in geological samples using cation exchange pretreatment and Ultrasonic Nebulization Inductively Coupled Plasma-Mass Spectrometry (USN-ICP-MS). Chem. Geol. 157, 219-234. Neal C.R. and Taylor L.A. (1998) Exploring the Complexities of the Serenitatis Basin: Breccia Clasts from Apollo 17. Internat. Geol. Rev. 40, 945-962. Neal C.R., Mahoney J.J., Kroenke L.W., Duncan R.A., and Petterson M.G. (1997) The Ontong Java Plateau. In: Large Igneous Provinces: Continental, Oceanic, and Planetary Flood Volcanism (J.J. Mahoney & M. Coffin, eds), Geophys. Mono. 100, 183-216. American Geophysical Union. McGinnis C.E., Jain J.C., and Neal C.R. (1997) Characterization of memory effects and development of an effective wash protocol for the measurement of petrogenetically critical trace elements in geological samples by ICP-MS. Geostandards Newsletter 21, 289-305. Petterson M.G., Neal C.R., Mahoney J.J., Kroenke L.W., Saunders A.D., Babbs T.L., Duncan R. A., Tolia D., and McGrail B. (1997) Structure and deformation of North and Central Malaita, Solomon Islands: Tectonic implications for the Ontong Java Plateau - Solomon Arc collision, and for the fate of oceanic plateaus. Tectonophysics 283, 1-33. Snyder G.A., Neal C.R., Taylor L.A., and Halliday A.N. (1997) Anatexis of lunar cumulate mantle in time and space: Clues from trace-element, strontium, and neodymium isotopic chemistry of parental Apollo 12 basalts. Geochim. Cosmochim. Acta 61, 2731-2748. Podosek F.A., Ott U., Brannon J.C., Neal C.R., Bernatowicz T.J., Swan P., and Mahan S.E. (1997) Thoroughly anomalous chromium in Orgueil. Meteoritics & Planet. Sci. 32, 617-627. Pearce N.J.G., Perkins W.T., Westgate J.A., Gorton M.P., Jackson S.E., Neal C.R., and Chenery S. P. (1997) New data for the National Institute of Standards and Technology 610 and 612 glass reference materials. Geostandards Newsletter 21, 115-144. Snyder G.A., Higgins, S.J., Taylor L.A., Jain J., Neal C.R., and Sharkov E. (1996) Archean enriched mantle beneath the Baltic Shield: Rare earth element evidence from the Burakovsky layered intrusions, southern Karelia, Russia. Internat. Geol. Rev. 38, 389-404. Mahoney J.J., White W.M., Upton B.J.G., Neal C.R., and Scrutton R.A. (1996) Beyond EM-1: Lavas from Afanasy-Nikitin Rise and the Crozet Archipelago, Indian Ocean. Geology 24, 615-618. Neal C.R., Davidson J.P., and McKeegan K.D. (1995) Geochemical analyses of small samples - microanalytical techniques for the nineties and beyond. Reviews of Geophysics, Supplement. U.S National Report to the IUGG (1991-1994), 25-32. INVITED. Snyder G.A., Neal C.R., Taylor L.A., and Halliday A.N. (1995) Processes involved in the formation of magnesian-suite plutonic rocks from the highlands of the Earth's Moon. J. Geophys. Res. - Planets 100, 9365-9388. Neal C.R., Hacker M.D., Taylor L.A., Schmitt R.A., and Liu Y.-G. (1994) Basalt generation at the Apollo 12 site, part 1: New data, classification, and re-evaluation. Meteoritics 29, 334-348. Neal C.R., Hacker M.D., Taylor L.A., Schmitt R.A., and Liu Y.-G. (1994) Basalt generation at the Apollo 12 site, part 2: Source heterogeneity, multiple melts, and crustal contamination. Meteoritics 29, 349-361. Taylor L.A. and Neal C.R. (1993) Comment on "Trace-Element Crystal Chemistry of Mantle Eclogites" by F. A. Caporuscio and J. R. Smyth. Contrib. Mineral. Petrol. 113, 280-284. Neal C.R. and Taylor L.A. (1992) Petrogenesis of mare basalts: A record of lunar volcanism. Geochim. Cosmochim. Acta 56, 2177-2211. Snyder G.A., Taylor L.A., and Neal C.R. (1992) A chemical model for generating the sources of mare basalts: Combined equilibrium and fractional crystallization of the Lunar magmasphere. Geochim. Cosmochim. Acta 56, 3809-3824. Neal C.R., Taylor L.A., and Schmitt R.A. (1991) Paired lunar meteorites MAC88104 and MAC88105: A new "FAN" of lunar petrology. Geochim. Cosmochim. Acta 55, 3037-3049. Neal C.R. and Taylor L.A. (1991) Evidence for metasomatism of the Lunar Highlands and the origin of whitlockite. Geochim. Cosmochim. Acta 55, 2965-2980. Paces J.B., Nakai S.N., Neal C.R., Taylor L.A., Halliday A.N., and Lee D.-C. (1991) A Sr and Nd study of Apollo 17 high-Ti mare basalts: Resolution of ages, evolution of magmas, and origins of source heterogeneities. Geochim. Cosmochim. Acta 55, 2025-2043. Neal C.R. Taylor L.A., Patchen A.D., Hughes S.S., and Schmitt R.A. (1990) The significance of fractional crystallization in the petrogenesis of Apollo 17 Type A and B high-Ti basalts. Geochim. Cosmochim. Acta 54, 1817-1833. Neal C.R., Taylor L.A., Davidson J.P., Holden P., Halliday A.N., Nixon P.H., Paces J.B., Clayton R.N., and Mayeda T.K. (1990) Eclogites with oceanic crustal and mantle signatures from the Bellsbank kimberlite, South Africa, part 2: Sr, Nd, and O isotope chemistry. Earth Planet. Sci. Lett. 99, 362-379. Neal C.R. and Taylor L.A. (1990) Comment on "Mantle eclogites: Evidence of igneous fractionation within the mantle" by J. R. Smyth, F. A. Caporuscio, and T. C. McCormick. Earth Planet. Sci. Lett. 101, 112-119. Neal C.R. and Taylor L.A. (1990) AFC modeling of lunar basalt petrogenesis: Sr isotope evidence from Apollo 14 high-alumina basalts. Proc. Lunar Planet. Sci. Conf. 20th, 101-108. Taylor L.A. and Neal C.R. (1989) Eclogites with crustal and mantle signatures from the Bellsbank kimberlite, South Africa, part 1: Mineralogy, petrography, and whole-rock geochemistry. J. Geology 97, 551-567. Neal C.R. and Taylor L.A. (1989) The petrography and composition of phlogopite micas from the Blue Ball kimberlite, Arkansas: A record of chemical evolution during crystallization. Mineralogy and Petrology 40, 207-224. Neal C.R. and Davidson J.P. (1989) An unmetasomatized source for the Malaitan alnöite (Solomon Islands): Petrogenesis involving zone refining, megacryst fractionation, and oceanic crustal assimilation. Geochim. Cosmochim. Acta 53, 1975-1990. Neal C.R. and Taylor L.A. (1989) Negative Ce anomaly in a peridotite xenolith from Malaita, Solomon Islands: Evidence for crustal recycling into the mantle or mantle metasomatism? Geochim. Cosmochim. Acta 53, 1035-1040. Neal C.R. and Taylor L.A. (1989) Metasomatic products of the Lunar Magma Ocean: The role of KREEP dissemination. Geochim. Cosmochim. Acta 53, 529-541. Neal C.R., Taylor L.A., and Patchen A.D. (1989) High alumina (HA) and very high potassium (VHK) basalt clasts from Apollo 14 breccias, part 1 - mineralogy and petrology; Evidence of crystallization from evolving magmas. Proc. Lunar Planet. Sci. Conf. 19th, 137-145. Neal C.R., Taylor L.A., Patchen A.D., Schmitt R.A., Hughes, S.S., and Lindstrom, M.M. (1989) High alumina (HA) and very high potassium (VHK) basalt clasts from Apollo 14 breccias, part 2 - whole-rock geochemistry; Further evidence for combined assimilation and fractional crystallization within the Lunar crust. Proc. Lunar Planet. Sci. Conf. 19th, 147-162. Neal C.R. and Taylor L.A. (1989) The nature of barium partitioning between immiscible melts: A comparison of experimental and natural systems with reference to lunar granite petrogenesis. Proc. Lunar Planet. Sci. Conf. 19th, 209-218. Neal C.R. (1988) The Origin and Composition of Metasomatic Fluids and Amphiboles beneath Malaita, Solomon Islands. J. Petrology 29, 149-175. Neal C.R., Taylor L.A., and Lindstrom M.M. (1988) The importance of Lunar Granite and KREEP in Very High Potassium (VHK) basalt petrogenesis. Proc. Lunar Planet. Sci. Conf. 18th, 121-137. Neal C.R., Taylor L.A., and Lindstrom M.M. (1988) Apollo 14 mare basalt petrogenesis: Assimilation of KREEP-like components by a fractionating magma. Proc. Lunar Planet. Sci. Conf. 18th, 139-153. Nixon P.H. and Neal C.R. (1987) Ontong Java Plateau: Deep seated xenoliths from thick oceanic lithosphere. In: Mantle Xenoliths, ed. P. H. Nixon, 335-345. John Wiley and Sons. Neal C.R. and Nixon P.H. (1985) Spinel-garnet relationships in mantle xenoliths from the Malaitan alnöite. Trans. Geol. Soc. South Africa 88, 347-354. Neal C.R. and Jain J.C. (2001) The Notre Dame Inductively Coupled Plasma ? Mass Spectrometry (ICP-MS) Facility: Into the New Millenium. Open File Report, University of Notre Dame, 38 pp. Jain J.C., Jana S., Neal C.R., and Sedlar A. (1998) ICP-MS: a powerful tool for trace-element analysis in wheat germplasm evaluation. Proc. 9th Interntl. Wheat genetics Symposium, Saskatoon, Canada Wheat genetics Symposium 2, 230-233. Jain, J.C. and Neal C.R. (1996) Report of the inductively coupled plasma-mass spectrometry (ICP-MS) facility, University of Notre Dame 1993-1995. Open File Report, University of Notre Dame, 29 pp. Neal C.R. and Taylor L.A. (1994) Catalog of Apollo 17 Rocks, Volume 3 - Central Valley, Part 2. 314 pp. NASA/Johnson Space Center. JSC Publication #26088. Neal C.R. and Taylor L.A. (1993) Catalog of Apollo 17 Rocks, Volume 2 - Central Valley, Part 1. 522 pp. NASA/Johnson Space Center. JSC Publication #26088. Neal C.R., Mackwell S., Plescia J.B., and Shearer C.K. (2013) Human Solar System exploration achieved with a “Moon first” pathway. Neal C.R. et al. [31 Co-Authors] (2009) The Lunar Exploration Roadmap. Exploring the Moon in the 21st Century: Themes, Goals, Objectives, Investigations, and Priorities, 2009. Submitted to the Inner Planets Panel, NRC Decadal Survey for the Planetary Sciences Division, Science Mission Directorate, NASA. Neal C.R. et al. [49 Co-Authors] (2009) Why the Moon is Important for Solar System Science. Submitted to the Inner Planets Panel, NRC Decadal Survey for the Planetary Sciences Division, Science Mission Directorate, NASA. Treiman A.H., Neal C.R. and Shearer C. K. (2009) Sample Return from the Earth’s Moon. Submitted to the Inner Planets Panel, NRC Decadal Survey for the Planetary Sciences Division, Science Mission Directorate, NASA. Neal C.R., Shearer C. K., Wadwha M., Borg, L., Jolliff B.L., and Treiman A.H. (2009) Developing Sample Return Technology using the Earth’s Moon as a Testing Ground. Submitted to the Inner Planets Panel, NRC Decadal Survey for the Planetary Sciences Division, Science Mission Directorate, NASA. Neal C.R. (2006) On the Lookout for Quakes on the Moon. Geotimes 51, no. 7 (July), 30-35. Neal C.R., Hood L., Huang S., and Nakamura Y. (2006) Scientific Rationale for Deployment of a Long-Lived Network on the Moon. Requested by the NRC Committee on the Scientific Context for the Exploration of the Moon.